Old Gear, New Gear, What Gives? We here at Apex Shrine know the importance of respecting the classics. This doesn’t only apply to the music we listen to, it applies to the type of equipment we buy. For example, my baby (Jack writing) is a Fender Deluxe Reverb that was built in 1972, and lightly modified somewhere along the line to copy a design that is even older still. Why drag around such an old dog? Surely they’ve come up with bigger and better things in the past 40 or so years, right? Well, it really depends on who you ask! Amplifier technology really did reach its zenith in the mid to late 60’s, and a lot of amp snobs would agree with that fact. Fender pretty much nailed it early on with their Bassman design, one of which is Danny’s larger tweed colored amp that he brings to shows. The perfect balance of pre and power amp tubes, and the hand-wired circuitry made these babies just sing. Amps of this primitive yet perfect design are so sensitive to the touch of the string, and so powerful in their purity and cleanliness. So we try to stick to that, simply because to our ears, these machines cannot be beat! Pawn shop guitars are way too much fun as well. 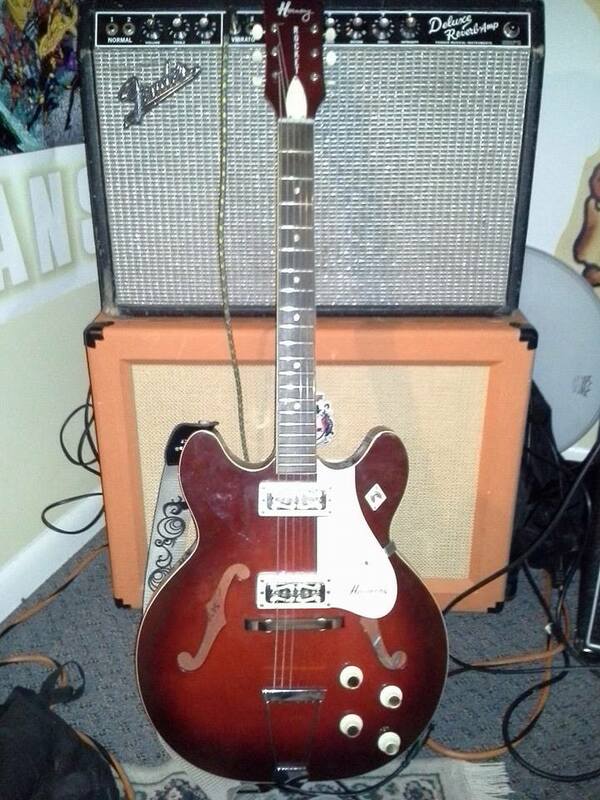 My main axe is a 1969 Harmony Rocket hollow body. It is an example of an instrument you would see in a Sears catalog in the 60’s. It was made in America, although much more cheaply than Gibsons and Fenders, but it still feels and sounds amazing! On stage, so much harmonic feedback flows through the pickups when in tight quarters that it feels like the guitar is about to explode! Brandon uses a pawn shop creation as well for his bass. It was built from catalog parts in the 80’s, and is so heavy that no human besides he can even lift it. That thing gives so much lowdown tone that we worry for the speakers in the bass amp, but that is a whole different article all together! Throw in the $40 Hammond house organ I found at Value Village to beef up some of our recordings, and the Shrine can be considered nicely rounded off with some hot vintage gear. The only thing that spoils the aesthetic is the silver MacBooks that we record into out of either our digital or analog boards. But that’s the way it goes today, and we are thankful we can record digitally with so much ease. The world of music is really opening up to creative types at home, and no matter what gear you use, there are endless ways to carve out some pretty killer tone. Just another little glimpse at our thoughts Inside the Shrine!